This has been floating around the social web for a couple of days now. 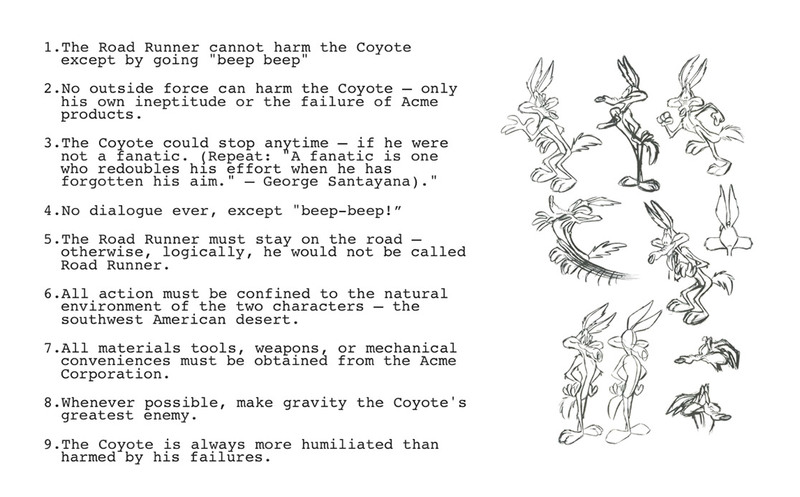 It's the rules for the Wile E. Coyote and the Roadrunner that we all know and love. And this is a wonderful example of focus. One of the key problems we see with so many products and brands is that they are trying to be everything. They have no purpose, no focus, and nothing that defines them. These rules changed that. These not only defined what they could and could not do, they also defined the purpose of the show. It wasn't about coming up with all kinds of adventures. Wile E. Coyote was incredibly predictable. We all knew that everything he would possibly try to do would fail. And quite spectacularly. What we didn't know was what he would try next. That's a wonderful way to think about things. As a brand, everyone should know what it is that you do, and what to expect from it. But what they don't know are all the new ways that you make that possible. If you are a fashion company, everyone knows that you make fashion, and they expect a certain level of quality, style, and market focus (e.g. upper-class menswear). What they don't know is how you will achieve that with your next campaign. Your role as a brand is not to be unpredictable. It's to be predictably creative.